Clarice Cliff 'Rhodanthe' Preserve Pot. A Clarice Cliff 'Rhodanthe' Bizarre preserve pot and cover. Printed Wilkinson factory marks to base. 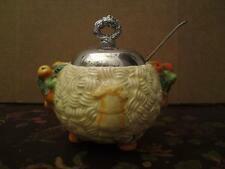 A Clarice Cliff 'Biarritz Capri' Bizarre preserve pot and cover. Clarice Cliff 'Biarritz Capri' Preserve Pot. Slight fretting to one corner of the cover. 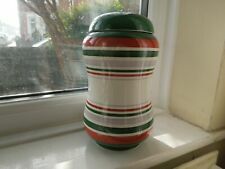 This is a lovely Clarice Cliff Liberty Stripe large lidded jar. The jar has the Royal Staffordshire Ceramics by Clarice Cliff Made In England back stamp. This is a lovely piece of original Clarice Cliff. 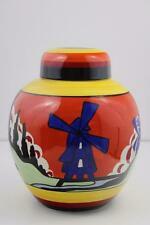 A Clarice Cliff 'Marguerite' Bizarre ribbed biscuit barrel. Clarice Cliff Biscuit Barrel. Printed Newport Pottery factory marks to base. It has a honey coloured glaze. Clarice Cliff. It is stamped Celtic Quality Plate Made in England. The jar has. C2A England moulded into the pattern underneath, and has green printed marks POTTERY Co. Size 7cm high (without the lid) and 12cm wide from both fruit shoulders. BOXED WEDGWOOD REPRODUCTION CLARICE CLIFF LTD EDITION LIDDED JAR WITH CERT NO 49. There is a small chip to the finial (see photo) otherwise good condition. Size approx height 9cm, width 11cm. COLLECTION FROM BROUGHTON JUNCTION 4 M180. Orange Marmalade Jam Pot. tiny chip but does not detract from the asthetic look.